Last year Hyperlite Mountain Gear (HMG) released their first entry into the high end ultra-light outerwear market with the intrepidly named brow-raising jacket, “The Shell“. Already well known for their ultralight backpacks and shelters made from expensive but high performance fabrics this level of design in a piece of clothing was sure to turn heads and I was quite excited to find out I would receive a demo model to review. I started testing in February while in the middle of my winter guiding season. This allowed me about 25 days of back-country skiing, mountaineering, and waterfall ice climbing to get acquainted. I only parted with my test model for a week to allow a fellow guide a chance to bring it on a South America climbing trip and was happy to get it back in time for a week long trip back-country skiing in Iceland. All in all this demo model saw 35+ days of combined multi-sport use from New Hampshire’s rugged White Mountains, to 17,000 feet on Ishinca in the Andes, to the Trollaski Penisula in northern Iceland. The results are in! Generally I like to start a gear review focused on the single most positive aspect of the item I’m reviewing and work down from there. With the HMG “The Shell” there was a four-way tie between Durability, Weight, and Pack-ability, and Performance. But durability ultimately wins out as this is the one feature I feel justifies the sticker shock when one first sees the price. This jacket is made from DCF-WPB fabric with Dyneema. Dyneema is stronger than steel for its weight and has excellent fatigue resistance (cyclic bending) and UV, chemical and abrasion resistance. This durability is brazenly referred to from HMG as “tough as f*#k”. Although the jacket has only been out for less than a year I’d say it is safe to assume this material and construction will last 3-4 times longer than pieces that try to achieve what this jacket achieves with so little weight. A more conservative statement would be “This jacket will easily have triple the lifespan of non-Dyneema jackets.” So if this jacket can easily outlast models that cost half as much while offering the benefits I will get into below that sticker shock might start to subside. If you get a chance to take one of these off the rack at a gear show you are going to be surprised at the weight, or lack of. You’ll need to look twice to make sure you really are holding it. A technical specification of 5.8 ounces does not do it justice, you need to hold this in your hand to get a sense of what “feather weight” really feels like. The only other shell I have tested that can come close to this ultra-light feel is the Black Diamond Alpine Start Hooded Jacket (2 ounces heavier). An amazing jacket at a more affordable price, but not 100% water-proof or nearly as indestructible as The Shell. The Shell has one small zippered pocket on the front right that can be turned inside out and used as a storage sack complete with a small sewn carabiner loop for attaching to the back of your harness. The stuffed size is about the size of a softball with about a 4 inch diameter. This pack-ability will let you stuff this into the smallest of CamelBaks, running packs, and waist packs for go anywhere mobility. There’s manufacturer claims and real life performance. Let’s look at each. Claim: Waterproof Ratting: 10,000mm– This means the jacket should handle moderate to heavy rain. Real-life: Unfortunate for our snow-pack but fortunate for my testing this past winter was plagued by multiple mid-winter rain events that allowed some serious testing of the waterproof claim from HMG. I wore this on at least three rainy adventures and my experience was that this jacket truly is waterproof. At first I was concerned about the front zipper as it did not look like the polyurethane waterproof thin zippers I was expecting (the small pocket on the jacket uses that style). Turns out HMG went with a longer lasting VISLON® Aquaguard® Zipper for the main zipper and I found it to be impenetrable even in the 40-50 mph raining-sideways-summit-day I had on Mount Washington. The slight stiffener in the visor on the hood was just enough to help keep the heaviest of downpours of the face. Claim: Breathability Rating: 32,000 gm2/24hr– This is an incredibly high rating of breathablity for a fabric that also can claim true waterproofness! Real-life: I’ll be honest and state that I was concerned about the breathability of a waterproof jacket with no pit zips or side ventilation. My concerns were first alleviated during an avalanche course I was teaching when I skinned from the trail-head to Hermit Lake, (2.3 miles, 1,870 elevation) in 1 hour 20 minutes on a 28°F (-2°C) day. It was one of the few times I’d ever left a shell jacket on while skinning in such fair weather all the way to Hermit Lake. Having easily logged another 20,000 feet of uphill travel in the back-country while wearing The Shell I can whole-heartedly attest to an accurate breathability rating! The only other pieces I could compare this level of breathability to is the Black Diamond Alpine Start Hooded Jacket or the Patagonia Houdini (not as indestructible as The Shell, or considered waterproof). The only media sample I could get was a size medium so the fit was a touch snug for my 180 lb 5’9″ build with a 42 inch chest. HMG’s sizing chart would put me into a size large which I think probably would have been perfect. It is important to recognize that Dyneema fabrics have almost no stretch to them which means clothing must be quite quite close to your body’s own specifications or quickly be to tight or to baggy. That said I was able to wear this as a “second skin” right over my Ortovox Merino wool T-shirts. In cold conditions I’d layer my mid-weight puffy jacket’s, my full belay jackets, or my heavy ski jackets over it. If I wanted to wear more insulation under it I would have to get into my appropriate size, which would have been a large. Bottom line is following the sizing info on the HMG website and it should fit you well! “The Shell”. Such a simple and confident name for a garment. It makes me think of the LOTR “one ring to rule them all” line for some reason. Is this the one shell you’ll ever need? Probably not. It is a niche type item. It is the epitome of minimalist functional artisan design. I love how it performed. I love the weight and pack-ability of it. I love that it is made in Maine! Who is this for? This is an obvious winner for the ultra-light crowd, whether you’re a climber, skier, long distance trail runner, or sea kayak-er I can see this becoming a new favorite. The simple expected lifespan of this piece (Dyneema does not degrade naturally as fast as nylon) means this could be one of the best value pieces out there for its intended purpose. Hyperlite Mountain Gear has entered the outerwear business with The Shell, and I’m really glad they did! Disclaimer: Hyperlite Mountain Gear provided me with this media sample. This post contains affiliate links. If you make a purchase after clicking on the these links, a portion of the sale helps support this site at no additional cost to you. I’ve been looking forward to getting this review published since November when a Hyperlite Mountain Gear 3400 Pack arrived at my door. Seeing HMG’s new re-brand and website launch today was the kick in the pants I needed to finish this review. So here it is! I’ve since enjoyed a dozen days of ice climbing and a couple back-country ski tours with this pack and have formed more than just a first impression. I want to share with my readers what makes this pack… and HMG in general… one of the coolest outdoor gear companies I’ve come across. Only 6 years old, Hyperlite Mountain Gear has quickly risen to compete with the best of the best in the outdoor gear industry. Their philosophy boils down to making bombproof technical gear that will perform in the worse possible conditions outdoor recreationalists throw themselves at. Design feedback from a diverse team of ambassadors goes right to head of the company. From bombproof HMG shelters to technical basic essentials like stuff sacks this company doesn’t take outdoor function for granted. To top it off, their products are all made in good ole’ USA, only a few hours away in the great state of Maine! So what really sets this company apart from most competitors? It’s obvious it’s their choice of fabric for their products. 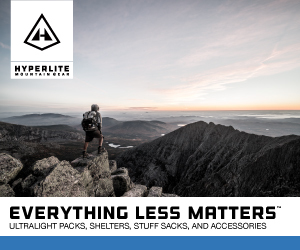 While most companies use various “deniers” of affordable rip-stop nylon and Cordura, Hyperlite Mountain Gear uses Dyneema® + Dyneema® Composite Fabrics (Formerly Cuben Fiber) Technology to provide incredibly lightweight, long lasting, water & abrasion resistant products. Read more on these materials here. “We designed the 3400/55L series of Ice Packs to function perfectly for passionate adventurers trudging through snow, climbing big ice or alpine lines and spending multiple days in wintry landscapes. Streamlined and minimalist, this ultralight backpack becomes a seamless extension of the athlete wearing it, enabling light and fast alpine ascents. Achieve your optimal self on your one- or two-day FA in the Ruth, Alaska or while attempting a Teton’s Grand Traverse-style link up. Given a four-star review in Rock & Ice magazine’s 2013 Photo Annual issue, this pack offers exactly what you need and nothing more (i.e. no frills, gizmos or the latest trending colors). Made from 100% waterproof Dyneema® Composite Fabrics (formerly Cuben Fiber), the 3400 Ice Pack is highly durable and weatherproof. Use it with our Stuff Sacks for a nearly perfect waterproof kit. We can custom fit this pack for skiers by adding reinforced Dyneema® side panels, bottom and ski holsters. 1. It swallows all my gear without me getting OCD about my packing. While I start off a trip super well organized at the end of the day when you’re ready to beat feet to the car I just want to dump my gear in without trying to “put the puzzle back together”. This pack opens up wide so I can dump my harness, helmet, and rack in and start making tracks to the trail-head! I can hold all of your gear! 2. Unplanned bivy. While I carry an AMK SOL Emergency Bivy Sack on every trip the 34 inches of unrolled length, half of which have has 1/4″ foam, would help insulate someone spending an extra night out. But how does it climb? I’ve lead over 4000 feet of technical ice climbing up to Grade 4 wearing this pack so far this season. That’s enough to know it climbs well. The real beauty of this pack is it can haul 40 pounds of climbing gear to the route comfortably, then cinch down into a little streamlined assault pack that you can forget you are wearing. While the waist belt is remove-able I just opt for reverse clipping it when it’s time to harness up. So why the lower grade for BC skiing? Well, because you can’t have one backpack that is awesome at everything. You just can’t. In the case of back-country skiing I want those convenient features like fleece lined goggle pockets and zippered compartmental access. A dedicated snow safety tool pocket is a must for those who ski in avalanche terrain a lot. But you know what? Most great BC ski packs suffer in volume when it comes to Ski Mountaineering. Need to toss in some crampons and a bit of rope for when the terrain you’re accessing is getting a little gnarly? This pack has you covered. Heading into Baxter State Park for a few days of long alpine routes & maybe a ski descent off Hamlin Peak? This is the pack I would bring. Basically, if the route is demanding and technical in nature this is the pack to arm yourself with. If you’re sticking to wearing your skis in terrain under 40 degrees you might be better off with a dedicated touring pack like the Patagonia SnowDrifter. But if you’re swinging the tools and getting into steep technical terrain this pack is an excellent choice. I’m excited to get some ski mountaineering trips in with this pack over the next few years. While this winter has really lagged in the Northeast I’m content knowing this pack will long outlive this El Nino by a decade or two. I’m also keen to test out more of HMG’s product line. If you are in the market for a top of the line ice climbing/mountaineering pack, this is definitely a company you should be looking at. DISCLAIMER: While HMG supplied me with this pack for the review my opinions stated above are 100% mine, derived from 2 decades of wearing out packs ice climbing and skiing in the North East. Affiliate links help support this blog. 8/18/18 UPDATE: Originally reviewed in 2016 I’ve since taken this pack climbing in the Cascades and on dozens more trips. It has held up flawlessly and will be in my pack quiver for decades to come! I’ve since enjoyed a dozen days of ice climbing and a couple back-country ski tours with this pack three winters and over a hundred days and have formed more than just a first impression. I want to share with my readers what makes this pack… and HMG in general… one of the coolest outdoor gear companies I’ve come across.